Grecotel Club Marine Palace & Suites is a popular hotel with tourists for being an environmental-friendly hotel. Take a refreshing dip in one of its 6 swimming pools, or let your kids enjoy at the water park with slides and a fountain. 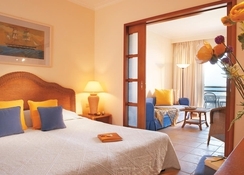 The hotel is located on the coast a picturesque bay, within walking distance of the village of Panormos in Crete. Located only a few kilometers from Rethymnon, the hotel has been built according to the traditional rustic architecture of Crete. The complex is very spacious and set surrounding a beautiful garden. The bungalows are two-storied and are picturesque against the landscape. On arrival, guests are welcomed with a refreshing drink. Grecotel Club Marine Palace & Suites is 16 km away from the seaside village of Bali and 22 km. from the town and port of Rethymno. The Heraklion International Airport is 67 km away. 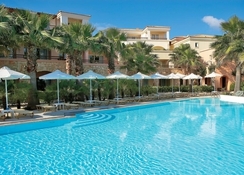 Grecotel Club Marine Palace & Suites offer a total of 50 guest rooms. Guests can choose from double rooms, bungalows, family guestrooms, family rooms, family bungalows and studios. Guests can reserve suites as well, with options of family bungalow suites, first row family bungalow suites, deluxe bungalow suite with Jacuzzi and family apartments. These beautifully decorated rooms, studios and bungalows are surrounded by fragrant gardens and offer views of the pool, the sea or the garden. All rooms have air conditioning, a TV and fridge, and some also have a kitchenette. Each bathroom comes with a hairdryer and free toiletries. 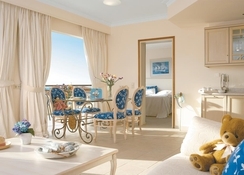 Rooms are spacious with the best views of the sea. With an offer of 12 restaurants and bars, the gastronomic offer is varied. 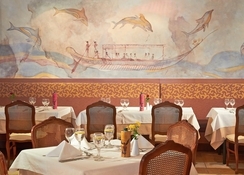 The hotel serves an all-inclusive dinner with a variety of delicious Greek, Mediterranean and Asian cuisines. Do not forget to try the hotel's Cretan organic restaurant Agreco, which has been awarded as the best organic restaurant in the world. 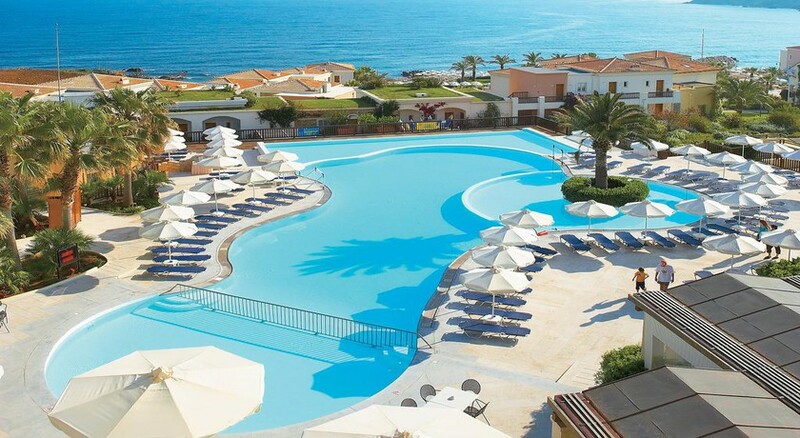 Grecotel Club Marine Palace & Suites features an Aqua Park with a host of rides and a children’s pool, varied sporting activities, water sports and a spa center with indoor pool, sauna, steam room and gym with cardiovascular equipment. You will also find many boutiques and shops near to the hotel, a 24-hour front desk and 24-hour medical care. Free parking is available on site.